November 19, 2018 – Rafiki wants to be known as humble (yet inspiring), responsible (yet flexible), courageous (yet successful) and hardworking! July 7, 2018 – This last school year was a challenging one academically for him, but Rafiki said that although it was a struggle at times he studied hard and passed his classes! This summer, he is looking forward to doing well at his internship, and finishing his summer class on taxation with a high grade! May 12, 2018 – Rafiki values his family and knowledge, because it is through the knowledge he has gained through school and his family’s support that he is where he is now! March 25, 2018 – When Rafiki was younger, he wanted to be a journalist because he wanted to be able to speak on behalf of the people in his community! In five years, he sees himself as a professional financial analyst! Feb 27, 2018 – Rafiki said he is inspired by Emely Patrice Lumuma, a Democratic Republic of Congo independent fighter for Congolese rights who fought for truth and his country’s independence! Jan 24, 2018 – Rafiki says that on Christmas people go to church then go home to continue celebrating with friends and family where they eat special meals and dance traditional dances to Christmas music! A word Rafiki thinks his friends would use to describe him is “courageous” because he is always happiest when he is working hard! Dec 18, 2017 – Rafiki says that on Christmas people go to church then go home to continue celebrating with friends and family where they eat special meals and dance traditional dances to Christmas music! A word Rafiki thinks his friends would use to describe him is “courageous” because he is always happiest when he is working hard! Nov 11, 2017 – This holiday season Rafiki is thankful for the Lord’s protection towards his mother! He is also thankful for the support of These Numbers Have Faces to attend university. Rafiki mostly enjoys Christmas with his family together. May 25, 2017 – Something Rafiki wishes more people knew about D.R. Congo is that despite negative things, the country still has many positives. March 27, 2017 – When asked about the 3 things he values most, Rafiki said his parents, education and business! Feb 13, 2017 – Rafiki says he feels empowered when people show their care for others. Being part of These Numbers Have Faces has allowed him to feel cared for, and opportunities to care for others, too! Jan 17, 2017 – Life isn’t without challenges. Last year Rafiki struggled with learning to do life more independently, as his family was resettled to the US. While challenging, he is seeing how he’s becoming more responsible! Dec 8, 2016 – In 2017 Rafiki has set his goals to improves his grades and practice better time management. He believes good leaders are organized, and he is well on his way to owning that skill! Nov 20, 2016 – When asked about what he’s thankful for, Rafiki said all those who helped him to have this opportunity to continue his studies, for it is changing his life! April 20, 2016 – When Rafiki thinks of role model leaders, he pictures Rwandan President Paul Kagame. What he admires about Kagame is his emphasis on teaching people to learn skills to become entrepreneurs. March 4, 2016 – When asked about his new goals for term, Rafiki said he wants to increase his knowledge on business practices, and score higher than 80% in his University courses! Jan 21, 2016 – Rafiki’s Community Impact Project is helping educate and advise members of his community in how to use resources for their surroundings to create a business! We’re excited he’s using entrepreneurship trainings to help counsel others! Dec 28, 2015 – What was the happiest moment of Rafiki’s year? His first day of classes at University! Rafiki said he once had no hope of going to University. We are so thankful he’s part of our program! Nov 8, 2015 – How many languages does Rafiki speak? 3! Kinyarwanda, Swahili and English! When Rafiki was a little boy, he watched his peaceful community in DR Congo become uprooted by violence. For the last twenty years, Rafiki’s family has lived as refugees in Rwanda, primarily in Gihembe Refugee Camp. Along with the struggles of poverty that exist in the camp, Rafiki also lost both of his parents. Raising himself and his siblings has been difficult, but Rafiki has held fast to his belief that one day the sun will shine. 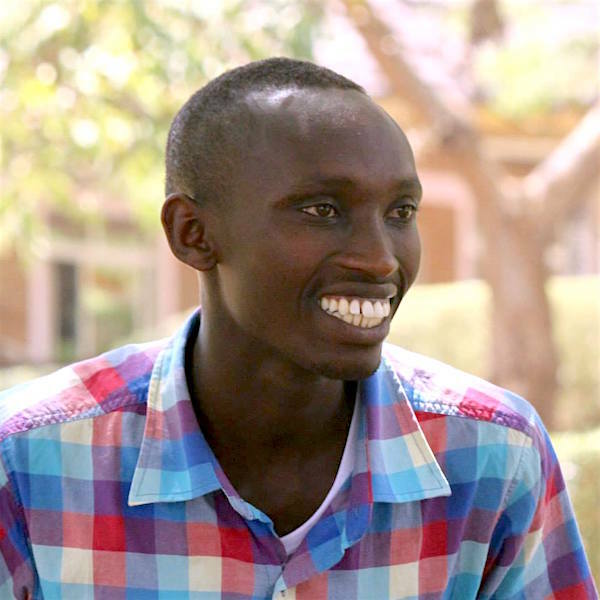 Believing a university degree can change his life, Rafiki is highly motivated to excel in his courses. He is eager to gain skills needed to help bring his family and community out of poverty. After graduation, Rafiki hopes to have a job as a financial analyst.